According to Site Meter one person hit my site while searching "when will crystal gale get a hair cut." Someone else hit it googling "head in a box". Ummmm, I am sure these things are not on my blog. When I was quite little, a print of the painting AMERICAN GOTHIC hung in my Grandma Drake's kitchen. It was on the wall next to the kitchen table. From my seat at breakfast or lunch (the only meals eaten in the kitchen) it was my view. At some point, probably around the age of 3 or 4, I asked my Grandpa Drake who those people int he picture were. He said "Why that's your Aunt Margaret and your Uncle Willy." Now, I had no reason to disbelieve this. My Uncle Willy was a bald old man, who DID wear overalls (although I never saw him with a pitchfork). He would give me jellybeans when I visited. Some for each hand. My Aunt Margaret is a dim memory to me, I just remember her being nice but I don't know why. I don't think she looked anything like the picture, but you know when you are little, you don't question the things adults tell you. So life went on. And that picture in the kitchen WAS my Aunt Margaret and my Uncle Willy. As I got older I thought it was sort of a strange picture to have taken, but never really thought much about it. And then, when I was about 15, my high school class went to Chicago for a field trip. One stop was the Art Institute of Chicago. Guess what Hangs at the Art Institute of Chicago. That's right. The ORIGINAL. And I realized right then and there that my Grandpa had told me a joke ten years before and that I had just gotten it. But before my mind could process it......I blurted out "Hey, that's my Aunt Margaret and my Uncle Willy!" Is there any doubt in your mind that I am still being hassled about this? Only babies that have now turned into little boys. 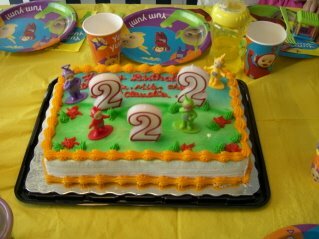 I'm not sure how it was simultaneously the shortest and longest two years of my life. One of the weirdest things about moving around as we've done is that you have to meet new friends. Friends are not easy to make once you are a grown up. Most of you probably already know this. I think that sometimes stay at home moms have an advantage here, because you have people around in the day that you can hang out with or visit with to let your kids play. When we moved to Kentucky one of the things that made me sad was that I lost my Indy friends. I didn't really lose them, but the inability to just see them and hang out with them at any given time was devastating to me. I have always been so very social. People dropping in to hang out any night of the week, big Sunday dinners when all sorts of random people would come by to eat, lots of cook outs and parties....Laura and I lived like that for a long time. It was a very warm and tight social group and when we moved I missed them all immensely. People came to see us in Kentucky twice, I believe. 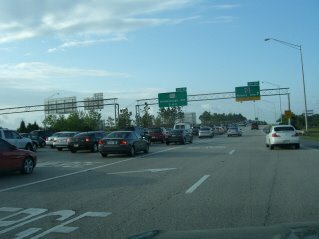 We were three hours away, but it wasn't convenient to get to and mostly we just didn't get to see people anymore. It was good practice for moving to Florida where it is like you fell off of the earth in terms of being near your friends. I made friends in Kentucky and a handful will probably always be my good friends. But Kentucky had just started to feel like home when we left. Don't get me wrong, I wanted to leave. But when I left, I missed it so. Now I'm in year 3 in Florida. I think 3 years is about how long it takes to become enmeshed in friendships for real. You start meeting people in the first year, but it takes TIME for them to settle into your life. It makes me so happy to finally feel that sort of connection with people. Saturday night was one of the most perfect nights I've had from that standpoint in a long time. There was laughter, and talking about lots of stuff. Random food, music, Florida weather and breeze, and a commaraderie that shouldn't be so rare to us. No stress, no drama. Just friendship and happiness. I look forward to another perfect night some time soon, when the beer drinking twin moms ride again. Not to be Confused with Flowers for Algernon, which would be a different and WRONG game to play with your friends. I'm imagining it now......yeah I'm sick. Okay, according to Lumpyhead 's Mom I am supposed to reveal something about Sarah. Well, something I bet you don't know or haven't seen (at least I don't remember it) is that the pictures they took for the Goon Squad's birth announcement pictures were of the babies wearing MISFITS onesies, if I remember correctly. I thought that was the freaking coolest thing I had ever heard. Most of Sarah's real life friends probably know this, but those of you in digital city are probably not aware. For Years in Business we've had stupid terminology that we bandy about as though it makes sense. We've given each other "Heads Ups". We've thought outside the box (not to be confused with shifting our paradigms). We've multitasked and we've been pro-active. We've done post mortems on events that had no actual dead involved. Most recently we've decided to either put up or take down silos, as is appropriate to the situation. My husband, however, has just made up the best new bit of jargon ever. I have decided that this means that we have to absolutely let all hell break loose and see who is left standing. I encourage all of you to "open the volcano", and to use this phrase at work as though it's common place. Anyone want to take bets how long this will take before you hear it on TV? Okay so I don't normally play these TAG games but after all it IS Sarah. SO she wants me to post 6 things about me that you don't know, or things that are weird. 2. I don't enjoy eating. It's hard to believe, being as heavy as I am and as I have been, that I don't enjoy it. But I don't. It's difficult for me to get into. When I have lunch or dinner and I am asked for "where do you want to go?" and I answer "I don't care," I'm not being a GIRL. I just don't care. 3. I exist in a state where my number one fantasy is just sleeping alone, in the dark in silence. I suspect most mothers do though. 4. When I told my mother I was pregnant the second time, SHE TOLD ME that she had dreamed that I was pregnant and that I was having twins. That I had come to her and woken her up to tell her. And she was right. 5. Until the day I had Louis, the day my brother Matt was born was the happiest day of my life. May 7, 1979. I had been an only child until that day. 6. Texture is more important to me than taste, when it comes to food, in most instances. I like things separate and simple. I don't like things all mixed up, which is why I don't like most Ben and Jerry's flavors - they have cold hard chunks of stuff in them that ,although they are good on their own, I don't like in the ice cream context. I like raisins but I don't like raisins IN food. The smell of some foods is also a huge turnout. Too much vinegar smell on your plate can affect my ability to eat my food. And like Sarah, I cannot STAND mustard. Okay, I have a definite opinion of Peeps. I love them. Specifically Chick Shaped Peeps. I don't care about the color so much although if I'm not hallucinating the sugars on them seem to have flavor, especially in the blue or purple ones. But I like my Peeps in a special way. I love STALE Peeps. I do not care for them straight out of the package. They are gooshey sugar blech to me straight out of the package. Ah.....but Stale Peeps? They are stiff, they have texture. Stale Peeps are a different experience. They become chewy, like some bizarre fondant. I do love Peeps. I just love them about two weeks after the rest of you. It's been a hectic week, of sick babies and flat tires and work and appointments. But the BEST part of the week so far has been my girls night out trip last night up to the House of Blues to see The Alan Parsons Project. I am the Eye in the Sky. Don't mess with me. It was fun but possibly more fun were the people that were at LEAST 15 years older than us, completely getting their jam on. In an effort to be fashionable I wore cute shoes, spiky high heels that look terribly cute ON my feet. But schlepping around Downtown Disney, Pleasure Island and STANDING all night plus dancing, well, they were NOT made for that. So my feet are quite blistered up. Sensible shoes for the next few days people. I hadn't been to the House of Blues before. It's really quite cool. Extremely festive. One of my favorite things about my night out is that my friend Nikki gave me THIS cool present, which I have loaded up right now with some New Media Mavericks blend. A new evil was brought to light this weekend. Satan has combined two things I love. Black and Tan - Ice Cream by BEN AND JERRY. I'm going to gain 100 pounds. To Create Butterscotch Bird Nests: Climb the Andes Mountains at the Spring Equinox to squeeze the nectar from the feathers of the Butterscotch Bird. Have the Nectar blessed by the Shaman of the Butterscotch Bird Tribe in an ancient ritual that is sure to improve the essence of the flavor. It's a good thing. Walk home via an ancient map that you discovered in the back of an ancient cook book. Once you get home, use a large pot similar to one used by the Stygian witches to melt your butterscotch. In fact, invert the Liberty Bell under said pot to create a double boiler - we don't want to burn our butterscotch! Once you have a melty consistency that is reminiscent of the consistency of a down blanket handquilted by blind vestal virgins in Holland, you're almost there. Stir for another 20 minutes but do not let it boil. Use only firewood made from Noah's Ark or the ONE TRUE CROSS to provide your heat source, or you risk contamination and inferior heating. After you have achieved the smoothest substance known to man you can add your Chinese Noodles. I like to travel to TaiYun in China to a little market located in the section of town where foreigners aren't really welcome. There you can barter with your soul and the wordly possesions on your back for crunchy little noodles -which are actuallly that are best served tossed in the blessed Andes Mountain Butterscotch confection. Melt Butterscotch chips in microwave until they are melty. Drop in bag of chinese noodles. Stir. 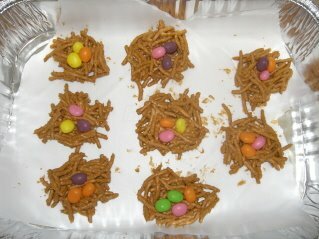 Make nests. Add Jelly Beans. At least Martha and I do that last bit the same. I also made these - but don't be too impressed - cupcakes are easy. 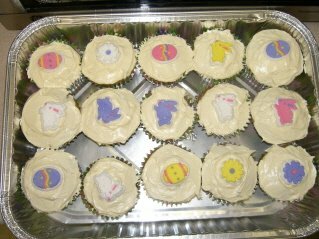 They're all treats for the twins club Easter Egg Hunt and Party! Don't you wish YOU were coming? First of all, this is located right near our house. 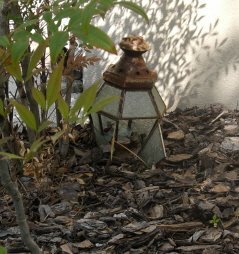 It's obviously and old discarded outdoor lamp. But to Lou it's Tinkerbell's house. We've decided that it's her vacation home. For those times when Disney World gives her a headache. Maybe it's where she flies to when she comes down off the castle every night. This other pictures slays me to no end. 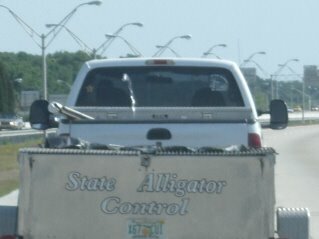 Not only was there a giant alligator IN this trailer, there was a just a lady driving the truck. How did she get that alligator IN there? And where was she taking it? How was she going to get it out? We're constantly rearranging in the company where I work. Knocking down cubicles, putting up different cubicles. Putting up cubicles where cubicles used to be and then tearing them down again. Violating the fire codes this way and that, only to be told we're violating the fire codes and having to change everything. It's like a game. You know how some people are obsessed with their office? I'm not that person. I just need space and a modicum of privacy and I'm okay. I am not an ego-maniac and at one point even turned down a REAL office with a door vs. a cubicle office - mostly due to the fact that the real office being offered also had all of the pipes from the upstairs bathroom running through it's walls. Every flush is a loud annoying sound. Plus it's an ice box. Way too cold in there all the time. I like to be in the center of the action where I can hear if any madness is going on. So today, they remodeled again. I lost a FOOT of width on my cubicle. I think today I made the only demand I've ever made that was office related. My new office no longer would allow my conference table to be in there, and I just couldn't stand it. I mean, if I'm being the lowest maintenace manager ABOUT the office situation, can I PLEASE Get something I want out of my office space? So, after I let everyone know how my office wasn't acceptable and would have to be fixed, the maintenance team was SAWING part of my old table off to make it fit and still not violate the fire code. Fine. It'll be smaller, but still there. See, I'm not unreasonable. My neighbor however is going to blow a gasket because she lost about 30 inches off of her office space. She now has a LONG THIN OFFICE that one might wisely walk into sideways. I wonder how it'll take them to put that back the way it was?